You can't stay any closer to The Nubble Lighthouse. Adorable 2 bedroom cottage with a loft. Amazing waterfront view! Wake up every morning and enjoy your coffee right on the water or relax at night with a glass of wine while you watch the waves hit the rocks. There is an ocean view from every room of this cottage. Plenty of yard space to spread out and play. Quick walk to Fox's Restaurant to get some ice cream or catch the Trolley and enjoy the scenic route around town. Here's a little bit about the cottage. The kitchen, living room and dining area are open concept. Converse with family and friends while preparing meals, all the while capturing the sites and sound of the ocean. There are two bedrooms, one with a queen bed and the other with an Ikea versatile sleeper. During the day, it can be a great second living area with a couch. At night, it converts to two twins or one king! It is very comfortable in any configuration. The loft is a cozy place for the kids, and can sleep one up there. This charming cottage provides a rare opportunity for the perfect vacation in Maine. The perfect spot to make for a relaxed and comfortable week (or two!) at the seacoast, reminiscent of the way life used to be or as we say in Maine, "the way life should be". Come, park and play! The Sohier Cottage is located so close to everything you can literally park the car and leave it for the week while you enjoy walking or take the Trolley to two beaches and downtown York Beach. If you are familiar with the Short Sands area, then you know there is plenty for everyone to do. Of course there is a sandy beach, but also a large modern playground, penny candy, casual and fine dining options and of course, ice cream shops! York Beach is unique in that it offers entertainment for the family that will remind you of yesteryear. York's Wild Kingdom is a small amusement park with a very nice zoo. We have our gazebo near the ocean where you can listen to live music many nights a week plus arcades and bowling. For those of us looking for more mature amusement, there are a few nicely appointed bars within an easy walk where you can sit outside and enjoy a refreshing adult beverage while enjoying the sights and sounds of our beachside town. If you do want some day trip excursions, there is so much to do in our area! 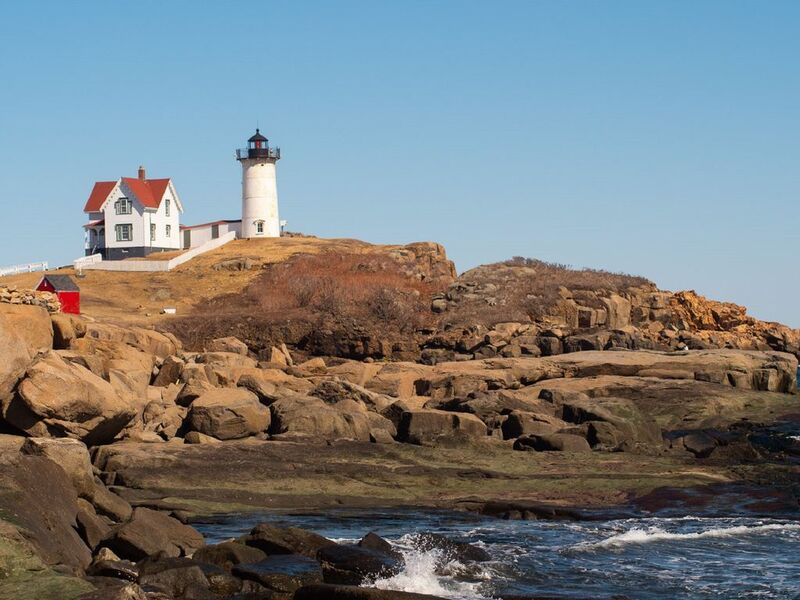 Here are some great ideas for family fun: Whale Watching out of York Harbor or Perkins Cove, day trip to Ogunquit to enjoy that 5 mile sandy beach plus great restaurants and shopping or play at one of two public golf courses in York. York Village is robust with colonial history featuring historic museums where you can travel back in time. Perhaps you might enjoy fresh or salt water fishing. There are locals here who will offer deep water fishing or guided kayak excursions. There is scuba diving, tennis courts, paddle boarding and so much more! The Cliff House, located on Shore Road between York and Ogunquit, is a world wide destination with a dramatic $100 million renovation that was recently completed in 2016. Enjoy a relaxing spa treatment or indulge in their gourmet dining. Perhaps live theatre is something you would love to enjoy on your vacation...well, we have it! Check out the Ogunquit Playhouse where nationally known stars are known to perform throughout the summer. Portsmouth, NH (just over the border and about 10 minutes away) also has fine live theatre at the Music Hall. Speaking of Portsmouth, let's not forget this wonderful small city. Always known for being a unique seaside port town, a resurgence has occurred over the last decade making this city a nationally recognized destination vacation spot on its own. Fine dining, live theatre, and unbelievable shopping attracts thousands of visitors each year. Contact us for more details on the Sohier cottage and availability. Whatever you decide to do, enjoy our comfortable cottage as your home base. We will do our absolute best to ensure you love your time here and want to come back year after year. Watch the occasional seal swim by and sea turtles have been know to raise their heads out here on this part of the Atlantic! Directly on the Atlantic Ocean! You cannot get any closer! Sturdy adirondack chairs set up on the lawn so you can enjoy the crashing waves all day long. It is unbelievable to be this close to the ocean,nubble lighthouse, Fox's Restaurant, Dunne's Ice Cream and still be able to walk to the downtown area to enjoy shopping and restaurants, ice cream and penny candy! Small cottage directly on the ocean with access to hundreds of feet of ledges makes the stay worth it. There's a small community of cottages where everyone has access to cross everyone's front lawns. But folks are friendly and it didn't bother us. Our granddaughters loved playing in the loft although it's usually too hot to sleep up there even with the window air conditioner on in the living area. There are Adirondack chairs in front of the cottage and on the ledge directly in front of the cottage that are NOT for the use of the renters of this cottage. Other than a picnic table, no other outside chairs provided. Every other cottage has Adirondack chairs and/or lounge chairs except this one. The owners should spend a little to provide these. Only two issues for us inside. Chairs and curtains. There are only two chairs for the table. There are four vintage commercial high bar-type stools that are of no value to this rental that should be removed and replaced with with additional chairs that will work with the table. Or at least buy some folding chairs and pack in the closet. There really should be six usable chairs in this unit for a meal if the owner makes the cottage available for six guests. Also, the kitchen table takes a leaf so six can eat, but we could never find the leaf. We knew from the pictures there were no curtains so we brought black curtains for the bedrooms. Again, the interior and exterior chair issues pale in comparison to the location. On a side note, Foxes Seafood is just steps away, but we come to the area often and they have raised their prices in each of the last two years. I don't know of a place from Kittery to Kennebunk that charges more for fish and chips. It's worth the ride to Barnacle Billy's in Perkins Cove or Mike's Clam Shack in Wells to have seafood with bigger portions and lower prices. Thanks so much for your careful feedback. We're glad you enjoyed your stay at our oceanfront, 1940s cottage. We agree that the unrestricted, slightly unreal views of the Atlantic make everything else fall back, just a little. Seriously. Thanks for noting the particulars of the space; it's not for everyone. Our fantastic (truly) neighbors are in close proximity (which we love) and our place is a quintesssential southern Maine cottage: one living room/kitchen; two bedrooms (one fully convertible into study; ask us how); one sleeping loft; one three quarter bathroom (with water pressure in the shower we miss when we're elsewhere). Thanks for reminding us that different families have different needs. We're keen to make sure our listing reflects this. Our place sleeps four routinely; five, comfortably (with a fifth in the loft); and six, easily, if one soul loves a futon/couch. We tried seven, ill-advisedly, once, so we list it as sleeps six. Funny that you mention our vintage stools... We've tried to offer a thoughtfully (maybe even graciously) appointed kitchen/dining space. We struggled with whether or not to leave the futon; having it against the breakfast bar means fewer stools there. We're grateful for your views. We do have camp chairs (that fold into these cool, cylindrical sleeves with carrying straps) in one of the closets. Maybe y'all missed 'em? And extra seating elsewhere (more at the table at the window and more for outside) are such thoughtful ideas; we're on it. Thanks! Having views of the Atlantic from every single window means it's our preference not to miss a second of the constantly changing light. N.B. The folks at Fox's are brilliant neighbors! We think one of the charms of our location (besides the views) is how cozy the place feels and yet how close we are (just just under a mile) to/from both Long Sands Beach and Short Sands Beach, which means that there are a dizzying number of food options when cooking-doesn't quite-happen, with other York restaurants a short ride away. And, as you noted, Ogunquit (and Portsmouth and Kittery) are super quick jaunts, too.